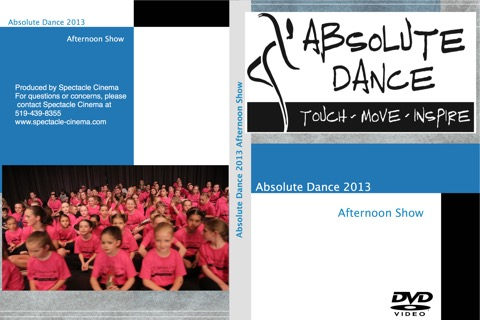 Absolute Dance 2013 production has been completed! The first orders began shipping this week. There will be a pickup location at the Dance Studio for orders that indicated pickup on Saturday June 08th. Please note there was a bug in the chapter markers in the afternoon DVD. Replacement DVDs have been sent for the Saturday Pickup. These new DVDs use a lightscribe printing label technology. They look great! Spectacle Cinema apologises for any inconvenience the chapter markers caused viewers. Please make sure to pick up a replacement DVD if you received yours by mail. Or contact Spectacle Cinema and a replacement will be shipped for original mail orders.